Hi everyone, welcome to day 3, omgoodness this week is moving along quickly! Today we've got 2 new stamps that coordinate perfectly with the dies from the Frames & Flags die set and the Framework Die set. The first being the new Sharks stamp. 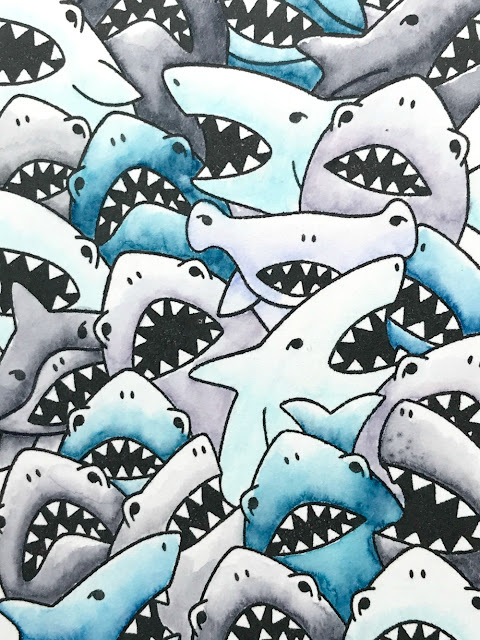 I took out my trusty Tombow Dual Brush tip markers and colored all these happy smiling sharks! Or, do you think they all may be hungry? I diecut the using the largest postage die from the Framework set. Then mounted on some turquoise cardstock. I'm adding my sentiment to the inside of the card as I didn't want to cover any of these toothy friends! 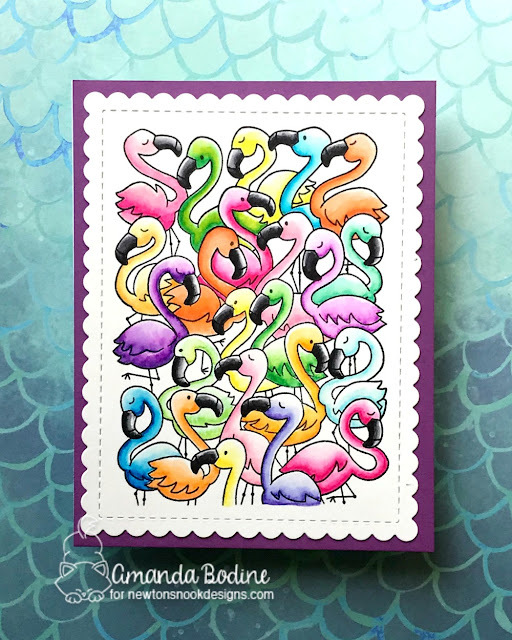 My second card is the Flamingo stamp, and I just had this idea to color them all different rainbow colors. Again I used my Tombow markers and just had fun! I cut the image out using the largest scallop from the Frames and Flags die set, then mounted on purple cardstock! So that's it for day 3, make sure to keep scrolling for your chance to win a store g/c! What fun background stamps. Love your cards. OMG...these are the cuties background stamps I have ever seen! Totally in love! Great job on the coloring! Wow!!! The coloring on the sharks is stunning!!! Love the colorful flamingos too!!! What a lovely, colorful card! as you want; and they are cute. Love those cards! flamingos are so fun in raindbow colors! Awesome cards. Love the rainbow of flamingos. That's a happy card and I love it. Oh these are both so fun! Love the colorful flamingos! 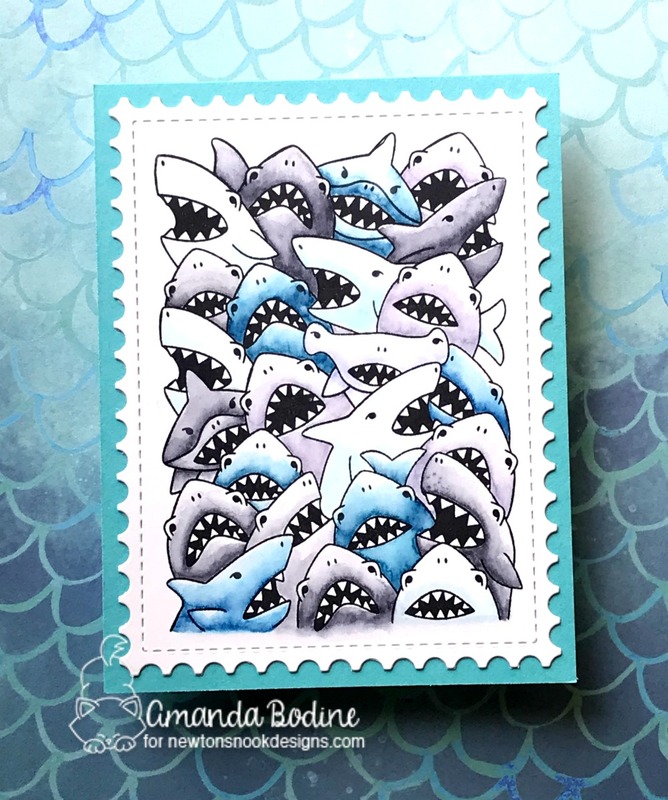 Love the different shades of blue for the sharks and the colourful flamingos. Cute--I like your coloring on both. 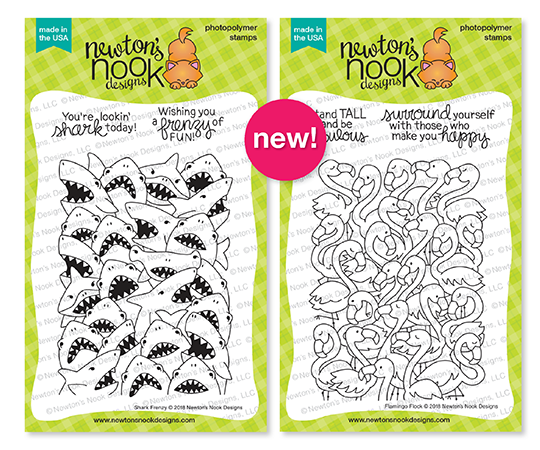 Love these, and such fun way to make a quick and cute card, and get your coloring fix! These are a fun addition to the release. Love your cards. 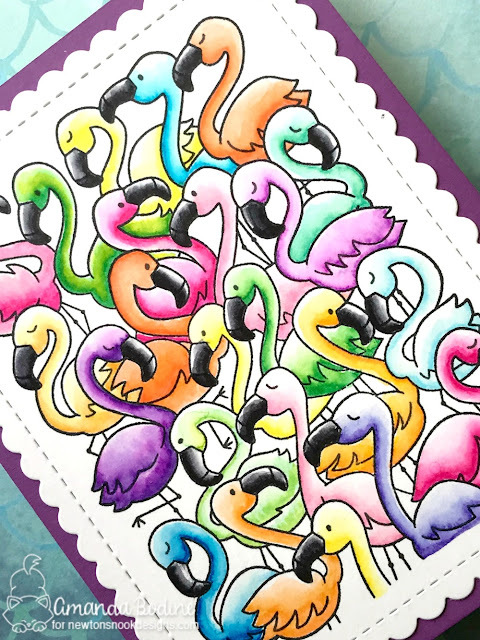 I love how you colored the flamingoes in all different colors! FUN CARDS! I would have to say my favorite one is the Flamingos card! I just love how you have them colored in different fun colors! Very pretty! "It's a RAINBOW of Flamingos"
Awesome!!! Thanks for sharing with us! Love these beautiful cards! The colorful flock of flamingos is so fun! I love today’s sets, they’re pretty fun to color and very unique. Awesome! What fun to have a rainbow of flamingos... I want to see 'em in real life!! Wonderful cards! So beautifully colored. Love your color combos. The rainbow flamigo's look so pretty!! Too funny!!! Love the colorful flamingos!!! Great cards! This release is such fun. Your cards are beautiful ! I love the multi-colors flamingos. These are both gorgeous! I love the multi-coloured flamingos! I'm really loving this release! Happy 5 years to Newton's Nook! Fantastic cards! I love how you coloured the flamingos different colours - fabulous! those are so fun and great cards!